Welcome to English In A Minute. Give us a minute and we'll give you a hot tip about English. 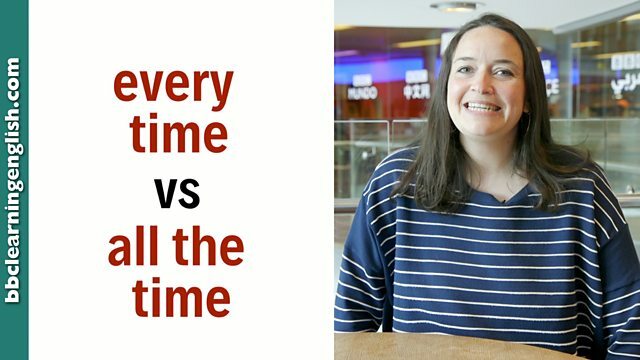 In this episode, Sam explains the difference between 'every time' and 'all the time' in just 60 seconds! Do you have a minute to spare to learn some English? Let Sam set out the difference between every time and all the time for you! Give us 60 seconds and we'll give you the English! Welcome to BBC Learning English. I'm Sam, and today we are looking at the difference between every time and all the time. We use all the time to talk about something that always or usually happens. For example, many people think that: In the UK, it rains all the time. And yes, it does rain a lot. We use every time when we are talking about each individual time something happens. For example: Every time I go to the beach, it rains. We don't know how often I go to the beach, but each individual time I go, it rains. There! We hope you learn something every time you watch one of these videos! We use every time when we are talking about each individual time something happens. We do not know how frequently this is, only that it happens each individual time. Every time I go to the beach, it rains. He's very reliable. He's there every time I need his help. It's like magic! She guesses the correct card every time! We use all the time to talk about something that always or usually happens. In the UK, it rains all the time. She's late all the time. We have to talk to her manager. What's their secret? They're happy all the time! Look carefully at the spelling! Is it one word or two words? Every time is for each individual time and all the time means always, but are we talking about a single continuing time or lots of individual instances? Every time is for each individual time and all the time means always, but are we talking about a single continuing time or lots of individual instances? Is there any difference in this context?